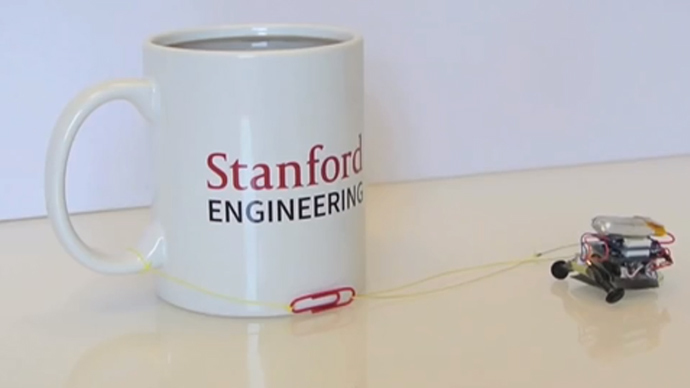 Tiny robots can climb kilometers of walls carrying objects over 100 times their own weight. They are to be presented by their creators, Stanford engineers at an international conference to take place in the US next month. The secret of a series of the super-strong robots, created by mechanical engineers at Stanford University in California, is in their feet, the design of which was inspired by geckos - or rather their well-known climbing skills, New Scientist reported. Various single-motor robots have differing lifting powers, but all of them are quite impressive. So, a 9-gram bot can climb with more than 1kg attached to it. Another, built under a microscope, with its weight just 20mg, can carry 500mg. The most remarkable robot is μTug, as with the weight of 12g it can lift a weigh that is 2,000 times heavier. As laboratory’s engineer David Christensen put it, it is "the same as you pulling around a blue whale." The bots have minuscule rubber spikes that help them to climb walls. As the weight pulls the robot down, the spikes bend, increasing their surface area and stickiness. Yet it is still easy for the robot to move, as the spikes straighten out again with each step. Another biological inspiration for the American scientists was an inchworm. This robot avoids falling and ‘parks’ itself effortlessly by moving only one pad at a time, thus keeping its balance. The scientists hope their project could be used as an alternative force in factories or on construction sites, as well as in emergency situations – they only have to work out larger machines. "If you leave yourself a little more room, you can do some pretty amazing things," said Christensen. The bots will be presented at the International Conference on Robotics and Automation in Seattle, Washington, at the end of May.